Of all the people I thought I’d miss while on the penal farm, Davey was at the bottom of the list. But after the first few days, once I’d got used to the electric fences and the guard platforms hovering above our heads, I started to think about him a lot. I thought about everything, from our first kiss to the fight outside the casino that got us locked up. I was still mad at him, but I felt like I had a hole inside me, knowing that hundreds of miles of Martian sand lay between us, and that I might never see him again. That was why I called the tractor Davey. As the only prisoner with the skills to program its AI, I was responsible for maintenance, making sure it could plough land that had lain untouched for millions of years. The green of its signal lights reminded me of my Davey’s eyes, and I saw something of his smile in the front bumper. Sure, it wasn’t really him, but it was better than nothing. “Your tractor’s acting up again.” Browne, the deputy chief warden, hauled me out of my bunk and down to the fields. The atmospheric transformation was still incomplete, and the thin air left me feeling tired after only a short walk. But I smiled when I saw Davey, lights blinking angrily, stalled just inside the fence. “Something ain’t right,” I told Browne after a few minutes nosing around Davey’s hard drive. Browne kept me up all night trying to get Davey moving. By dawn I was just about there. “He’ll need resets every eight hours,” I said, a plan spinning in the back of my mind. This could be my chance to spend more time with Davey, to fill my days refining his programs instead of taking my turn cleaning the farm’s filthy bathrooms. An hour later I was jolted out of bed, my body writhing at the electric prod of a stun baton. Rubbing sleep from my eyes, I stumbled out to the field. Davey the tractor was rolling back and forth across the same six feet of dirt, like my Davey pacing as he stewed over some hurt or scheme. I laid a hand on the bodywork and the machine stopped, lights blinking in acknowledgement of my presence. Cracking open the control panel, I switched on its monitor and started exploring Davey’s mind. It was getting caught in loops of logic, refusing to act until it could think its way clear. But it was a simple AI without any skill in self-reflection, so instead of finding a solution it just rolled back and forth, the frantically running engine making it hotter and hotter under the bonnet. As I stared at the subconscious workings of the tractor, I realised that my own subconscious had been at play. I’d missed my Davey so much that I’d given the tractor his habits. Now its programs were so tangled up, there’d be no clearing it without a complete wipe. I didn’t want to do that to my Davey. Dozens of other prisoners stood, picks and shovels idle in their hands, as they watched me grapple with the tractor while Browne paced impatiently beside me. It can’t have been all that exciting, but then neither was digging dirt. Now I understood, the answer was obvious. I drew the AI’s attention to a part of its own code, highlighting what I saw as crucial flaws. It was like telling someone they were being an idiot. Suddenly the engine growled. Wheels spun and Davey the tractor raced away from me, just like my Davey had outside that casino. I ran after, head spinning as I fought for breath in the thin air, and flung myself on the back just as I would have fainted. Behind me, Browne stood shouting and waving her stun baton. Davey hit the electric fence. There was a shower of sparks and a rending sound. For a terrible moment I thought the fence might be tougher, but Davey was strong. Wires snapped, the engine roared, and the other prisoners cheered as I rode through the gap out onto the wastes. They started running after me, guards shouting and chasing them. Slumped across the back of the tractor, I looked across hundreds of miles of red desert. 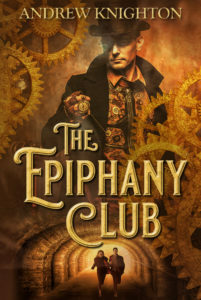 If you liked this story, and you’d like to see more like it, then please consider signing up to my mailing list. You’ll receive a free ebook, short stories straight to your inbox each Friday, and updates on my upcoming releases. 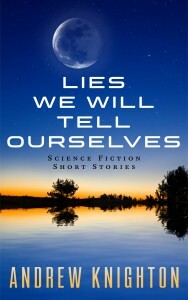 You might also enjoy my science fiction collection Lies We Will Tell Ourselves, which is free today as a Kindle ebook via Amazon. Next Next post: Is Ancillary Justice a Commentary on Ancillary Justice?